and watch a film together. When it comes to gifts we mainly just do a card and a little gift. Stuart and I use to go out for a meal and buy cards and gifts each year for it. is a bouquet for flowers. 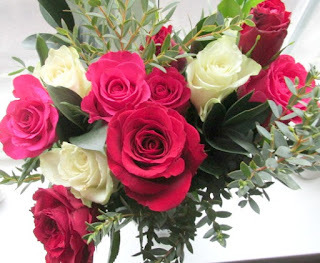 I think most women love to get flowers and I was recently contacted by the people over at Blossoming Gifts to see if I would like a bouquet from their Valentines Day Flowers selection. 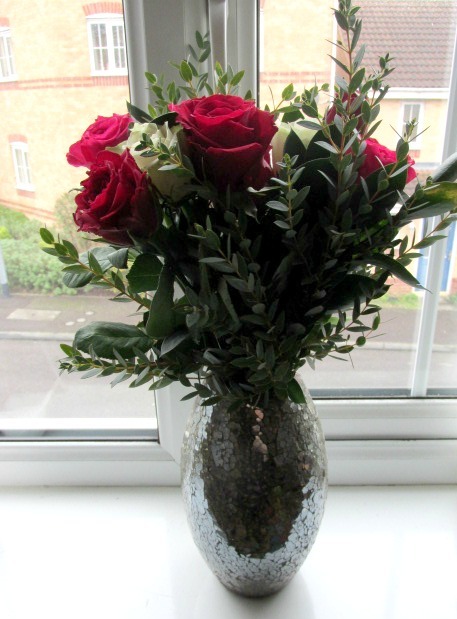 Blossoming Gifts are a new and exciting flower delivery company based here in the UK and they specialise in beautiful florist designs at a low cost. As well as offering a wide range of hampers, wines, plants and personalised gifts. It was very hard to choose which bouquet to go for as they are all gorgeous. reminded me so much of my wedding bouquet as it looks quite similar to it. The Mixed Rose Bouquet has a beautiful mix of colours for that different gift this valentines of 12 red , white and cerise pink roses. I was in. They have a range of delivery options so that you can make sure that if you are ordering for valentines day that they arrive in time. The flowers arrived early in the morning and were in a box with the Blossoming Gifts logo. bouquet which as you can see is eye catching and very colourful. a little booklet with info on how to care for your flowers. 33% off a bouquet. The only bouquets exempt from the discount is the 'Flowers By Post' range. To get 33% off use : BGIFTS33 at the checkout.